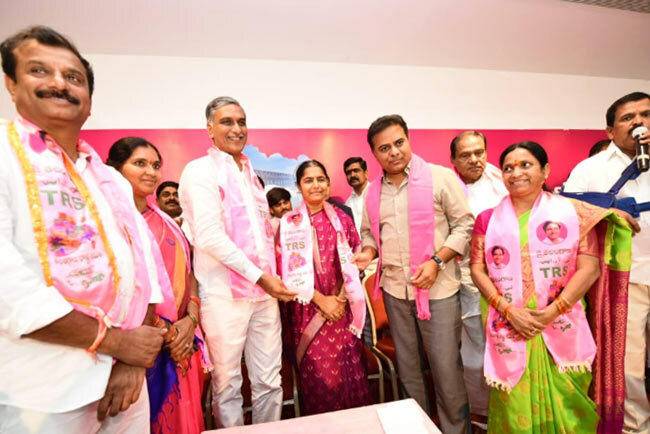 The influx into TRS continues as senior Congress leader and former Minister V. Sunitha Laxma Reddy along with her supporters have joined the ruling Telangana Rashtra Samithi (TRS) formally in the presence of TRS working president K.T. Rama Rao and former Minister T. Harish Rao on April 1, 2019. In the meeting, Former Minister Harish Rao said, both the Congress and the BJP are not in a position to win even one seat each in Telangana and that was evident in AICC president Rahul Gandhi’s Zaheerabad election rally on April 1, 2019, where only a few thousands had turned up. Mr. Harish Rao also stated that there were not even one thousand supporters when Congress candidate for Medak Parliamentary constituency had filed his nomination papers. Addressing the gathering at the joining program, TRS working president KTR said every section of the society is approving the leadership of Chief Minister K. Chandrashekar Rao and the joinings are an indication. He reiterated that TRS could play a key role in the formation of the next government at the Centre by winning 16 out of 17 Lok Sabha seats in Telangana as all pre-poll surveys were indicating a hung Parliament.